What I like most about Dr Pepper Snapple Group stock is that although every investor will undoubtedly recognise their flagship products you always get the feeling that despite being a $16bn company in their own right they are something of a hidden gem. Considering that its sister companies, Coca-Cola and PepsiCo, are two of the largest and most successful corporations in American history I guess it’s not that surprising, and the fact that it doesn’t have that same unbroken history of trading as a public company probably adds to the effect. Given that it trades at like 20x earnings, has a a history of double digit earnings growth and can generate 50% returns on tangible capital every year I also think that it happens to be one of the biggest no-brainers in today’s historically overvalued markets. Part of that diversification article also looked at the fact that some of the boring industries like tobacco, food and beverages have delivered the highest shareholder returns over the last fifty or so years (see here). A lot of that is down to branding power, which of course Dr Pepper has in spades. Despite it being a lot smaller than the other two – partly due to selling the international licenses on its products – as a trio they pretty much share the exact same characteristics that make them such high quality businesses. I guess it also has very similar business economics to Hershey – largely confined to the United States, a stable operating industry and sustainable high returns on invested capital driven by a lot of branding power. If you had to stuff a portfolio with just four stocks then Coca-Cola, PepsiCo, Hershey and Dr Pepper Snapple Group would at least allow you sleep comfortably at night. The first three are, not through coincidence, also in the top performing stocks of the last half century. As I said above the stock doesn’t have the unbroken record as a publicly traded stock, which makes it difficult to analyse the long-term returns of owning a slice of their brands. Having floated in 2008 via a spin off from British firm Cadbury Schweppes as it was then known, it does at least offer a useful guide on what happens when you invest in great companies on the right side of the valuation multiple. In its current form the stock began trading at the beginning of May, 2008 at a price of $29 per-share. The turmoil of the financial crisis was in full flow as financial institutions were collapsing. The S&P 500 was trending downwards from its peak and the stock dropped from an IPO price of $29 to $25 in a matter of days. But let’s concentrate on Dr Pepper Snapple and its underlying business. Full year earnings for the prior year, 2007, were $1.96 per share – which gives a P/E ratio of about 15. Even in the depths of one of the worst financial crises in modern economic history the underlying earnings would only go on to take a hit of a few percentage points. Most of its products occupy the number one or two positions in their respective categories, and even given the turmoil of the time an investor can part with capital knowing that years down the line Dr Pepper, 7Up and Schweppes will still be selling to thirsty customers. 15x earnings for businesses with such strong brand equity and core earnings power represent once in a decade opportunities. A $10,000 investment at IPO date would have purchased 344 shares at the $29 share price quoted above. In such a tumultuous time that’s not without a heck of a lot of short term risk to the stock. In fact it went on to plummet more than 50% as the financial crisis played out over the following months – finally bottoming out at just under $12 a share in March, 2009. That’s a P/E of under 10x, and perhaps a once in a lifetime investing opportunity. Let’s assume the investor held with it though from May, 2008 and was happy to treat it like a private business; happy to extract the cash flows without worrying about day to day market valuations. The following eight years would have provided excellent returns as the core economics of the business remained strong as well as benefiting from expansion of those historically low valuation multiples. 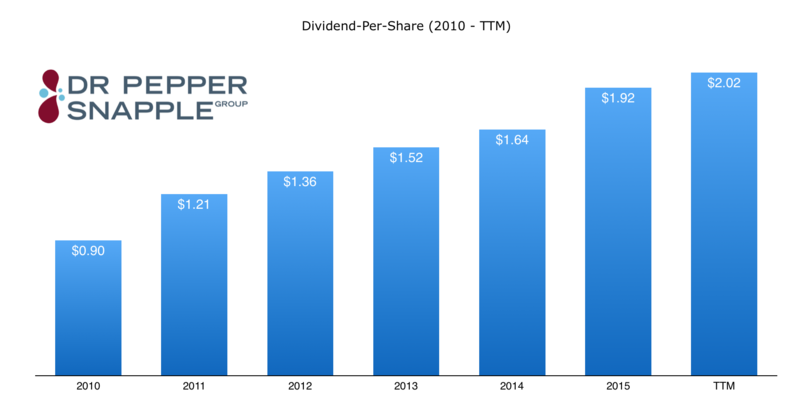 In addition shareholders have received $3,175 in cumulative dividend income for every $10,000 invested at IPO. In total that amounts to 31.75% of the initial capital – to be used either to accumulate more stock or to spread around into brand new positions. The shares themselves are today worth $91 each – or about $30,000 in terms of the initial $10,000 investment. Those kind of returns are born out of exceptionally good quality companies trading at prices that underestimate future growth potential. It’s the exact same reason why tobacco companies have delivered such strong shareholder returns over the last couple of decades despite the challenges facing their industry. Throw in a high dividend yield to accelerate the compounding and the end result is compounded annual returns in the mid-double digits. Over an investing lifetime that’s an awful lot of money. Looking at the Dr Pepper Snapple Group today and the risk adjusted returns still look pretty attractive. It’s trading at around 20x earnings with a recent history of double digit earnings growth. The underlying business regularly converts 10% of sales into free cash flow to fund dividends and buybacks. The latter alone has been running at over 3% of the float for the past few years. That means that, on average, every five years there are 15% less shares in issue than at in the first year, giving long term holders an ever increasing slice of those high quality earnings. Throw in a couple percent from the dividend along with a similar level of organic growth and you start to see how these types of companies end up ranking near the top in terms of multi-decade market returns. All that for owning a company that can bring in 50% of tangible capital in net income each and every year.